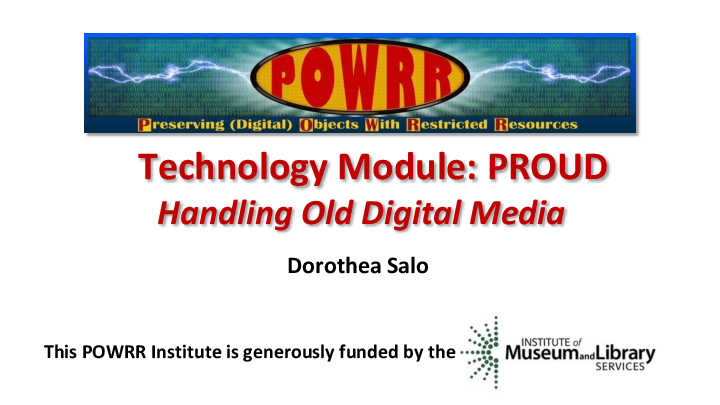 In this presentation, Dorothea Salo, Faculty Associate in the iSchool at the University of Wisconsin at Madison, discusses some of the options available for dealing with old digital media. Topics covered include: equipment options to rescue data from digital media in-house; how to write-protect several types of digital media; and what a disk image is and how to capture one from several types of digital media. This presentation was part of the 2018 POWRR Institute, held in Warm Springs, OR in April 28-29, 2018.